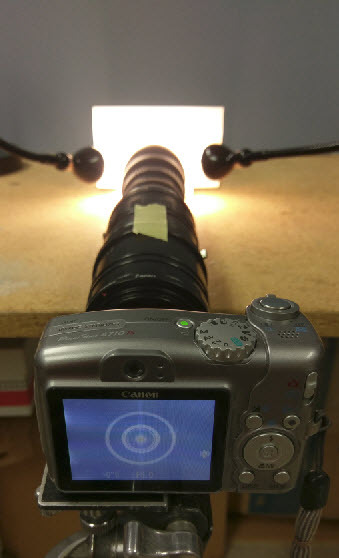 From time to time people ask how to mount a Raynox DCR-150 for use as a tube lens with microscope objectives. Here is one scheme that works well and is made entirely of off-the-shelf extension tubes and adapter rings, plus some DIY flocking. Parts #10 and 11, the two rings labeled "optional", are mainly to provide a few mm of extra separation between the objective and the Raynox DCR-150. Some tests have show that this makes a slight improvement in image quality. Note: it is critical that you add flocking or baffles to kill reflections from the sides of the tubes and rings. Failing to do this can severely degrade image quality! The most reliable way to see reflections is to simply point the assembly at a bright light, stick your eye where the camera sensor will be, and look for any bright rings surrounding the central aperture. For illustration, here is a setup that uses a small camera to do the looking (with an extra set of tubes to block out external light). You can see in the live view on the back of the camera that this assembly has a lot of reflections that have to be killed. Here is a test target to show the effect of glare. It consists of a white card with a hole poked in it, the hole exposing the interior of a closed box lined with black flocking. It's pretty safe to say that only an insignificant amount of light is actually coming out of that hole. Here is the flocking used to eliminate the reflections shown above. The thin strip covers the mount ring at the camera, and the larger panel covers the entire inside of the string of M42 tubes. I used black Doodlebug cardstock . An alternative material is Protostar self adhesive fabric; there is also a newer Protostar sheet material that looks quite good but I have not worked with it yet. Both are available HERE. In addition to these two sheets of flocking, I also added a circular sheet of flocking on the back of the objective adapter, to kill any reflections bouncing back off the Raynox. And just for completeness, I put a small dot of flocking on the end of a registration pin at the outer bayonet of the first set of tubes, which was responsible for the small isolated bright spot shown in the second row of the panel of reflections. Probably it was too small to visibly matter, but it was simple to eliminate just to be safe. One more detail... Some extension tubes have bayonet fittings that do not fit as tightly as I would like. But in this tube assembly, it's very simple and effective to epoxy the M42 adapter (part #2) against the bayonet of the extension tubes (part #1). That leaves the entire tube assembly composed of screw threads, which are quite rigid. As of this writing (Sept 2017), all of the parts here can be ordered from Amazon, except for the objective adapter which comes from an eBay vendor, and the flocking material. Total cost including the Raynox is about $170 plus tax, with shipping inside the U.S.
wow very nice explanation and example. Thank you very much rik! Nice writeup, images and explanations! Sometimes eBay has 52mm tube screw sections in 7, 14 & 28mm sections available cheap. These can mount directly to a Nikon BR2A for camera mounting. 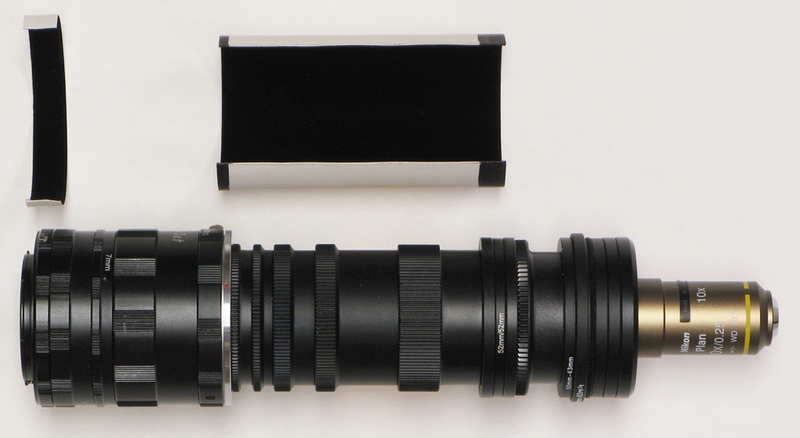 With Canon tubes from Fotodiox on the rear, this assembly gives just about perfect infinity focus. 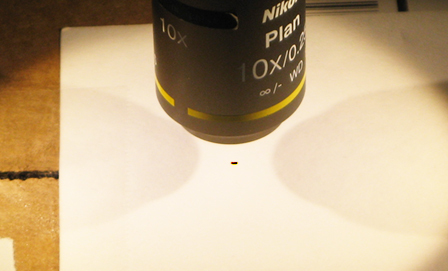 With Nikon tubes, as shown here, the longer flange focal distance of Nikon bodies makes the tube assembly a few mm too long, so it ends up focusing maybe 30 feet out. 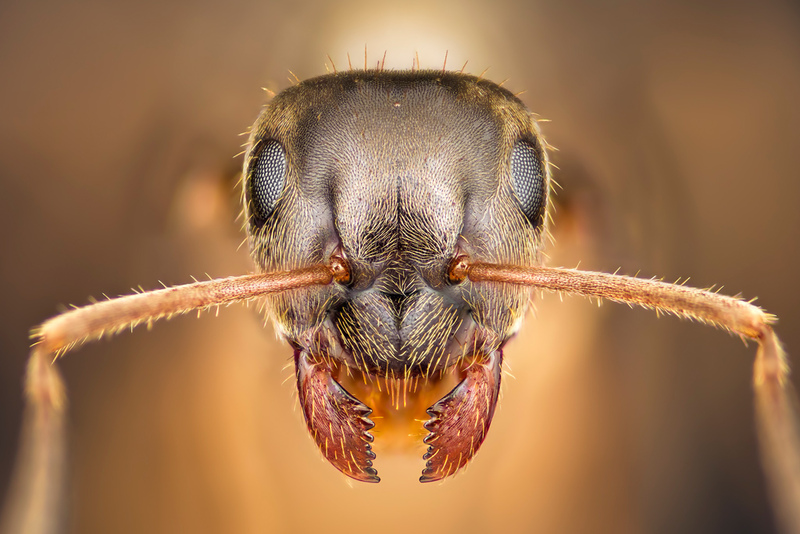 Standard extension tubes are uniformly multiples of 7 mm long, so by just choosing tube combinations the focus error can be as large as 3.5 mm. But if you want to get it dead on, then it's a simple matter to replace some of the M42 fixed tubes with an M42 focusing helicoid. Those are mechanically less rigid than fixed tubes, so they are best used in a vertical setup, or locked in place with epoxy after adjustment. (Duct tape would also work fine, if you prefer the mad-scientist look.) If you use a helicoid, remember to add flocking; some helicoids are almost like mirrors on the inside. Great share! For ease of use I just grabbed the kit from MJKZZ that comes with the Variable Extension Tube (already had a sleuth of stepup/down rings and adapters for Cannon to Sony). My problem with the MJKZZ VLE is that it's just a thread and doesn't actually have any sort of locking mechanism. It's supposed to help achieve that perfect/optimal working distance from sensor to Raynox; however, it isn't too reliable as a forgetful mind/hand will easily unscrew it forward/back. Thanks for the link. Lots of good info on that page. 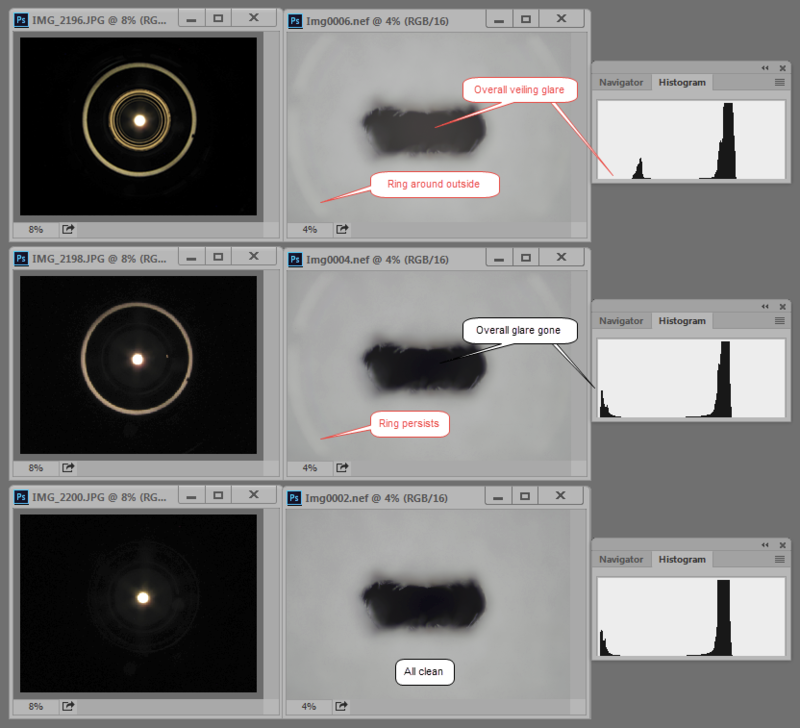 As a purist, I would quibble that it makes the common mistake of assuming too much about the optics of the Raynox, with the result that the distances are not quite correct. The analysis essentially assumes that 1) the rear principal plane of the Raynox is located at the shoulder of its mounting threads, and 2) the published strength of "4.8-Diopter" really does mean 208.33 mm focal length. Neither of those is likely to be quite right. But the distances he gives are certainly close enough to work well. 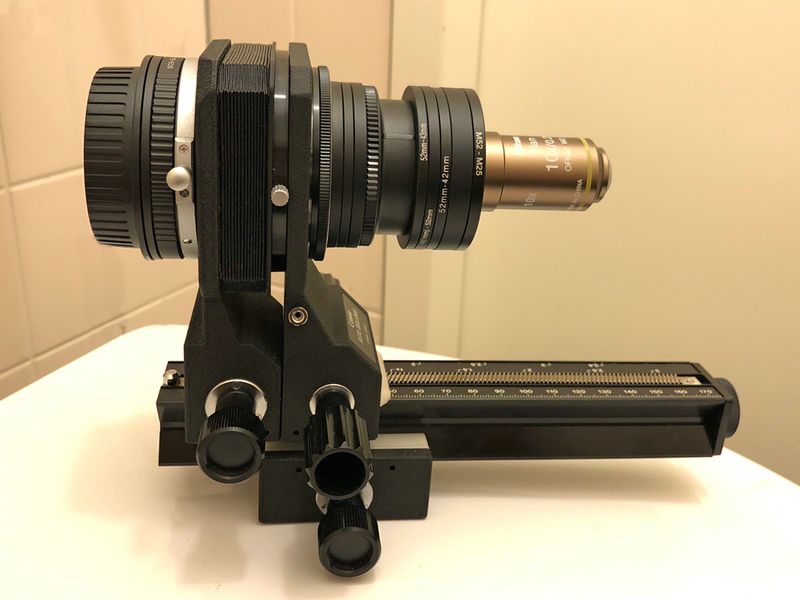 On Canon mount, with the Raynox front forward (not reversed as shown in my setup), I get infinity focus with 167.0 mm of extension, versus the 164.33 shown on his page. That's only 2.67 mm difference, not significant in practice. You could use a 42mm to 52mm ring adapter that has the 42mm through threads to lock the VLE in place. Use it as a "locking nut" on the VLE. Might be good enough to hold position, but don't know I haven't tried. These cost ~$1 including shipping on eBay. Good idea, but I have some concerns about whether those very cheap adapters are actually the right size. The ones I see look like standard step rings, which likely have 42mm x 0.75 mm thread pitch, like T-mount. The VLE is 42 x 1.0 mm, like regular M42 extension tubes. Normally I use the Protostar product, but Rik discussed "Doodlebug 1898 Beetle Black". Not readily available as such any more, but the Hobby Lobby sells it under a different SKU. Beetle Black Crushed Velvet Scrapbook Paper - 12" x 12"
You can order it on-line as well. My understanding (from a conversation with Doodlebug Design) is that this is the same as the Doodlebug 1898 product. (Remember this does not have an adhesive backing). Thanks. That looks interesting. I'll have to try some. BTW, it is available in quite a few widths. Would it be a good thought to use one of this in front of the Raynox in order to reduse the number of steps that are required with wide apertures? Adding an iris just behind the objective is always an option if you're willing to trade off resolution for more DOF per slice. If you want to add an iris, then you should take some time to think through the whole chain of parts. Adding a 58 mm iris into a chain of 52mm parts seems awkward and may introduce extra separation between iris and objective. I would probably go with an M42 iris and a flat M42-to-objective adapter, replacing parts 11 and 12 in the parts list. My tube assembly was inspired by this great post, many thanks for that! Actually it is exactly the same from parts 4 through 12. The difference is that I use bellows (Canon Auto Bellows). On the rear of the bellows I use an FD to EOS adapter (eBay) and on the front a Fotodiox M42 to Canon FD mount. Just like in the assembly of this post, the DCR-150 is reversed and the two "optional" rings (parts 10 and 11) were added to provide some extra spacing between the objective and tube lens, which is supposed to slightly improve image quality (I haven't made any tests without the optional rings nor with the DCR-150 in its normal orientation). Worker ant (Lasius niger). Stack of 97 images using the Nikon CFI Plan 10x/0.25 at around 10x. Stacked in Zerene Stacker (DMap with very little Pmax retouching). The assembly feels very robust and stable, everything fits tightly and no flocking tape was required in my case (probably because of using bellows? ): its very dark in there. Will this scheme also work with a Mitutoyo Plan Apo BF 20X NA 0.42 (M26 x 36 TPI), provided I replace the last part of the scheme (#12) by an M52 - M26 adapter? I'm about to purchase a used Mitutoyo 20x and would like to know if it will be that simple. So it looks like using a Mitutoyo 20x on my current assembly would be as easy as buying a M52 - M26 adapter... or am I missing something? Please let me know if this question needs to be in a separate thread. Switching subjects a little: be sure to carefully check out that used Mitutoyo as soon as you receive it. A small but important fraction of used Mitutoyo objectives have been knocked out of alignment internally, so they look fine on the outside but give degraded images when examined closely. See http://www.photomacrography.net/forum/viewtopic.php?t=20594 for my own experience with a 10X that turned out to be bad. That was very interesting reading and good advice, thanks. The conclusion is that Mitutoyos are especially fragile and one should be extra careful when buying used Mitutoyo objectives. The seller has no return policy but claims that the condition is excellent and the lens is clear (no delamination or fungus). He will even send me a test stack so that I can see for myself. Would it be realistic to expect the Mitutoyo 20x to be sharper than my new purchased Nikon CFI Plan 10x/0.25 (MRL00102)? Or at least equally sharp? The MRL00102 is notorious for its strong CA but it's very sharp and if the Mitutoyo is not that sharp then I would not buy it.